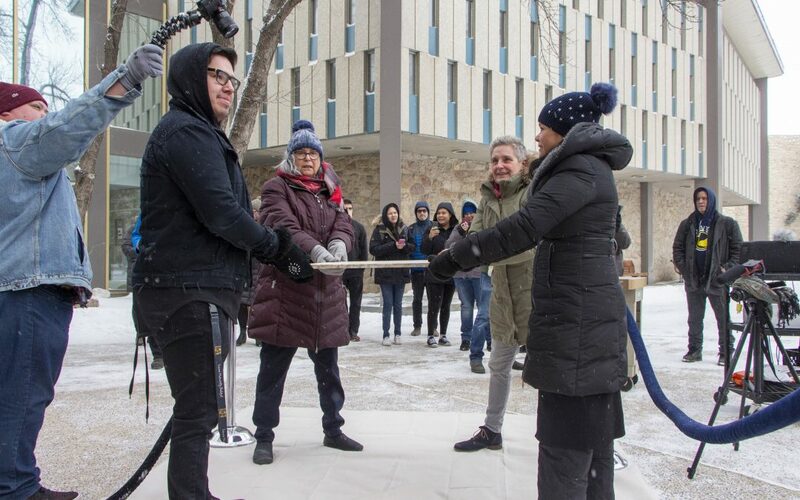 Two Cree artists received some help while creating a piece that addresses Indigenization and decolonization as part of Indigenous Achievement Week at the University of Saskatchewan. Ruth Cuthand and Vanessa Hyggen have been working on the collaborative art project called “mîkisak ikwa asiniyak ǀ Beads and Stone ǀ Lii rasaad aykwa lii rosh” at the top of the ramp in the Arts Building on the U of S campus. Cuthand says the project began with the breaking of a slab of Tyndall stone this past Monday which included a pipe ceremony, speeches and feast. The broken pieces were then integrated with beadwork which Cuthand says lots of people have come to help with. The finished piece will be unveiled on this year’s International Day for the Elimination of Racial Discrimination, which is March 21. “Created by this unique group of artists, Beads and Stone gives voice and substance to a vision for a new kind of university in an extraordinary and compelling image,” Jeremy Morgan, interim managing director of the University of Saskatchewan Art Galleries, says. A screening of a film captured by Indigenous artists and filmmaker Marcel Petit will also take place at the unveiling. The film will document the creation process of the art project and will feature a poem written by Cree-Dene-Métis poet Zoey Roy. The five-day Indigenous Achievement Week wrapped up on Friday.